The Pneumatic 'rise and fall' Roller Track provides an efficient system to enable the movement of airfreight containers or palletized products into trucks and trailers. The principle of pneumatically raised rollers is to have the rollers available only when loading and unloading is required and not during transit. The load is 'live' for loading and 'dead' for transportation. 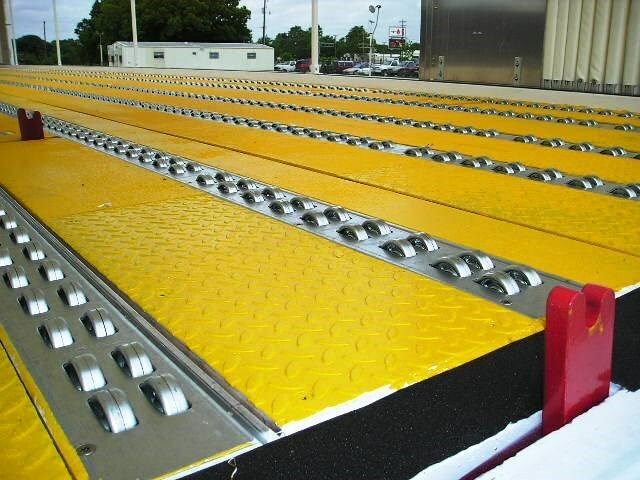 » The world's most versatile low height pneumatic roller track. » Top plate positively secured preventing lifting or twisting. » Aluminium extruded main channel allowing a lighter and more robust construction. » 16mm Roller Lift to aid pallet movement. The purpose of a pneumatically raised roller track system is to provide an efficient roller system to enable the movement of loads, product or machinery within a predetermined location. The principle of a pneumatically raised roller track system is to have the rollers available only when movement is required, with the load safely located on a floor in a static position at all other times. The simplicity of the system means that Hydraroll pneumatic roller track can be used whenever a roller compatible load needs to be moved and then held stationary on a flat floor. Hydraroll Pneumatic Roller Track needs only a low-pressure air supply to raise the rollers above the level of the surrounding floor. » The loading of air cargo unit load devices. » Within dry freight vehicles for regular palletized goods. » Simple conveyor system on manufacturing lines. » Specialized carpet carrying vehicles. » Test rigs within environmental test chambers. » Mobile mass entertainment vehicles. » Specialized mobile banks & stock exchange field units.